All multi holed seed beads and pressed beads are in this section: SuperDuos, Twin beads, Rulla beads, CzechMates Bars, Bricks, Daggers, Lentils, QuadraTile, Tile and Triangles, Piggy beads, Silky beads, Chilli beads, RounDuos, Tila and Half Tila, Tile, Pyramid beads, Bi-Bo beads and Chexx beads. Curved beads with a central hole. Used with a trumpet or bell flower and a round or firepolished bead and you have an angel or fairy. Another great idea by Sabine Lippert is the Gekko bead. It is similar, in size and shape, to the Dragon Scale bead but with the bead hole across the top. This allows you to include the Gekko bead in even more beadweaving stitches. Another new idea from Sabine Lippert, Spiky Button® is the fancy sister of Button Bead®. The bottom part is the same shape as the Button Bead so you can easily exchange it in designs. Button Bead®, the newest idea from Sabine Lippert, are a cone shaped bead about 4.8mm in diameter and 4mm tall. Ideal for bead embroidery and bead weaving. Find patterns using Button Beads in the Pattren section. Dagger beads in several sizes from the mini dagger at 2.5x6mm to the largest at 7x17mm. All sizes can be used in fringing or for adding texture, the mini dagger may be used as a substitue for a drop or teardrop. Dragon® Scale Beads are another bead from the Czech Republic designed by Sabine Lippert. 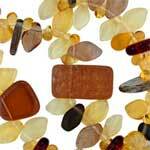 Lozenge shaped they are ideal for adding texture to beadweaving and bead embroidery designs. Flat back dome beads 14x8mm. Can be used as a bead or a cabochon. Teardrops are useful in fringing or for adding texture in designs. Toho Magatamas and Miyuki Drops are in the Shaped Seed Beads section. English cut beads are round pressed beads emulating rough cut beads popular in the early 19th century. 6mm lentil shaped beads drilled off-centre with one hole. A domed button shaped glass bead. Can be used in stringing, kumihimo or simply use as toggles. O beads®, another great idea from Sabine Lippert, are a flat ring shaped bead about 3.8mm in diameter. Ideal for bead embroidery, bead weaving or stringing. One® beads are a flat oval shaped bead about 5mm by 3.5mm and 1.5mm thick with a hole of approximately 1x1.8mm. Ideal for bead embroidery, bead weaving or stringing. A new shape from the Czech Republic, Preciosa Pellet Pellet Beads are a versatile hourglass shaped cylinder 4 x 6mm bead with a central hole. When strung the beads interlock. Rose Petal, and Tulip Petal beads each in two sizes. Pinch beads are 5mm long, 3mm wide and have three sides. Pip beads are a new bead from Preciosa. They are petal shaped approximately 5mm wide and 7mm long with a hole of 0.6mm in diameter. Six beads in a circle create a flat flower. The beads fit well with Twin, SuperDuo beads and seed beads. The Prong is designed to hold focal beads in your design and can also be used as an additional design element with beads from the CzechMates Beading System. Quad beads® are a flat square shaped bead about 4mm wide and 1.5 mm thick. The central hole is approximately 1.5mm in diameter. Ideal for bead embroidery, bead weaving or stringing. Rizo® Beads are shaped like a grain of rice and smaller than a dagger but longer than a drop and are ideal for adding texture to beadweaving designs. Handmade Spike, Baby Spike and Gumdrop beads are all useful for providing texture, stringing or as interesting cabochons. SuperUno beads are designed to fit with SuperDuo beads. They are the same shape but with just ONE hole. Preciosa Thorn beads are thorn shaped spikes 5x16mm. The same size as daggers but with a rounder cross-section they are great for adding texture to designs and for fringing. Tri-beads are a new bead from the Czech Republic. They are triangle shaped approximately 4.5 mm wide and 1mm thick with a hole of 1 mm in diameter. Originally the idea of bead designer Lisa Kan (author of Bead Romantique), this new shape can be used as an embellishment in bead weaving designs, to create angular textures in beaded ropes or simply strung.